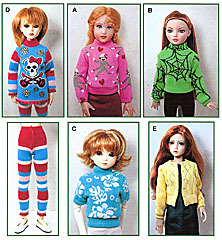 Order #: PMSD-09101 - MSD size Sweaters-To-Sew pattern to fit 16" MSD size ball-jointed dolls, Ellowyne Wilde and 14" Kish Chrysalis dolls. Fun to sew sweaters using socks as the fabric. Pattern includes pattern pieces and instructions for 4 different sweater styles (all sweaters - EXCEPT for the cardigan style - are mde to close down the back with either snaps or zipper), 4 different sleeve styles and 2 different leggings (one made from sock fabric; the other from cotton/lycra knit fabric).